Decisions, decisions: which gadget should I buy? You probably won't be forced to choose between a tablet or ereader or make other similar difficult decisions very much longer. One reason, of course, is that their capabilities are being merged in ways that may make a single device suitable for many uses - but that is not the main reason you'll avoid these agonizing choices. With all the uses for this versatile crop of new devices, it's very likely you'll have more than one. We certainly have numerous magazines and books on hand not to mention newspapers. If tablets, ereaders and smartphones become universal tools, a family will most likely have several. After all, it's not uncommon to have multiple PCs in the house; it often makes sense to keep an older machine when upgrading since they have little resale value and work quite well at common tasks. Of course students regularly use computers for homework and the competition for "the computer" can get fierce in the evening. It's important to note that we are in the early stages of the Mobile Revolution and dozens of different shapes and sizes of devices will come out soon. Distinguishing between tablets and smartphones will become increasingly difficult and naming conventions will evolve rapidly. In any case, it is quite likely that a variety of tablets and other mobile devices will be used to replace collections of books, magazines and other publications. No matter how much we enjoy the feel of a "real book", we will rely increasingly on electronic means for much of our information and that means more electronic devices will be needed for access. Business cards have been around for three hundred years but their fate may be sealed soon. We've tried numerous ways to track our contacts including business card holders and scanners to enter the information into our computers. There was certainly promise to automatic character recognition to convert card images to text but the artistic flourishes on many cards have rendered that strategy problematic. An email address embedded in a sea of flowers is just as hard to read by software as by the human eye. Bumping has come to the rescue. There is a free app for iPhones and Android phones that automatically transfers contact information between two phones when they touch each other (bump). To learn more go to the companies web site www.BU.MP. The process seems quite mysterious but it turns out the direct physical contact is not what matters. Because phones have built in GPS, it is easy to determine when two phones are near each other. Second, they have motion sensors that can sense when they move or are jolted. Tapping two nearby phones on the table would yield the same result. But since their may be other phones nearby, and another phone might be jolted at the same time, it is possible to connect with the wrong person. That's the reason, that each participant in a "bump" must confirm the identity of the other party before a connection is made. In addition to exchanging contact information, the Bump software allows you to exchange photos, social network connections and calendar events. Probably the most vexing but least discussed question concerning ebooks relates to your ownership rights. When you buy a real book, there is no questions what you can do with it - keep it, sell it, give it away or throw it away. What happens after you pay for an ebook? Can you transfer it to another similar device, another different type of device, a device owned by a friend, etc? Can you in fact create an ebook "library" like you would with real books? For years people have erroneously thought when they "bought" software they actually owned it - wrong! Virtually every software product includes a license agreement which strictly limits what you can do with it. You do not own software; you are a licensed user. I firmly believe ebooks are the way of the future. It is just not clear how that future will develop and there are certain to be some unexpected bumps in the road along the way. 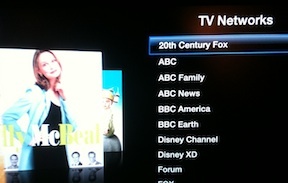 Not surprisingly many of the issues (formats, licenses, etc.) are what we've dealt with for years with software. Since touch screens are all the rage today, I thought I would expand on what I wrote last month when discussing stylus input. In that piece I explained the difference between resistive and capacitive touch screens - generally resistive screens are less expensive, require more pressure and are increasingly being replaced by capacitive models that are super sensitive to your touch. If you compare touch devices, you will begin to notice more differences. Again there is a low cost approach that works like an ATM - touch an icon and an action is triggered. More sophisticated screens incorporate three additional capabilities - multitouch, physics and gestures. As the name implies multitouch devices let you use more than one finger at a time - tapping with two fingers means something different than tapping with one - much like a right click on a mouse produces a different result than a left click. A physics capability means the response of the screen mimics physical actions. For example, swiping your finger across an ebook page causes the page to appear to "turn" like a real book. I first noticed the realism this adds one time while reading on my iPad and had the urge to actually pick up the page to turn it. it became that "real" because of the way the device responded to my movement. Finally, gesture means the screen responds to movements - such as the swipe across the screen mentioned above. A common example is that opening or closing two fingers changes the magnification of the displayed image - combining multitouch (two fingers) with gestures (finger movement). Both e-readers and tablets will drop in price sooner rather than later. We've already seen a significant drop in e-reader prices as a result of the iPad introduction. One way to reduce prices when the pressure becomes intense will be to use cheaper, less sophisticated touch screens. There's nothing inherently wrong with this but you need to make sure you know what you are getting before you buy. Without gestures, tapping an icon would turn a page. Without physics pages would turn in some programmed fashion. These may seem like minor issues until you experiment with different products. In general the lower priced gadgets will have the least number of these capabilities. How "natural" it feels to use a touch screen will depend significantly on if and how multitouch, physics and gestures are incorporated. We hear about smartphones and tablets being used for communication, games and productivity but what's available for your artistic side? Since a picture (or in this case six videos) is worth a thousand words, I won't even try to describe the possibilities for painting with finger or pen on a touch screen. I will say I was amazed. Click here to see the exciting possibilities in this article by Jonny Evans. Thankfully we are now past the stage of "megapixel bragging"; every camera today has more than enough megapixels to do the job. Image stabilization (IS) is the most significant improvement in photography in recent years. If you've never experienced it, hold a camera zoomed to 300+ mm and see how different the image is with and without IS turned on. But one thing that still plagues amateur and professional alike is the uneven distribution of light in many images. On a sunny day, for example, the bright sky causes the camera to close down the aperture and underexpose the subject. Most people learn they can set the camera to allow in more light - back light compensation - but then the nice bright blue sky turns almost white. The highlights are said to be blown out. It turns out our eyes can see a wider range of light intensity than a camera. Professional digital photographers have a solution. They spend money on expensive cameras, spend more money on Photoshop and then spend time combining three separate images - one standard exposure, one over exposed and one underexposed. High end cameras can easily produce this set of images. This is not an approach most people would want to try but the results are amazing; details are present in the bright, dark and intermediate areas of the picture. On September 1, 2010 Apple announced an upgrade to their iOS software - used in iPhones, iPods and iPads. 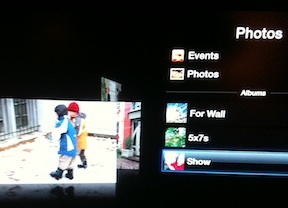 This change allows the camera to take the necessary three images and automatically combine them into an HDR photo. The results looked impressive in the demonstration but I'll have to see real results before I believe it. This approach does not require anything special in camera electronics or optics since the process is just rapid image capture followed by sophisticated image processing. Since all smartphones and the upcoming hoard of tablets generally include cameras, it is likely other vendors will implement similar capabilities that will produce better images and require little if any change in user behavior. Thinking of a camera for Christmas? If you think it's time to upgrade your old 15 megapixel camera, this may be just what you need. A camera company you've never heard of - Leaf Technologies - just announced their 80 megapixel monster. That's no typo. You need plenty of memory cards though because each image takes nearly one-half gigabyte of storage. Oh, and you also need plenty of money; the basic model is $31,387 - also not a typo. And of course if you want to take any pictures, you need to buy lenses; they aren't included with the camera. If you keep your eyes open, you can probably pick one up for 10% off on e-bay. Actually, when you think about it, it's not such a bad deal. The previous model cost the same amount and had only a lousy 56 megapixels. There are many sides to the debate about ebook readers (e-readers) compared to "real" books. Often the question of environmental impact centers around the fact that paper comes from trees therefore real books are bad. As in most such debates the reality is more complex. Much of the impact of both types of books - and other products as well - occurs long before you even see them. Rare minerals and hazardous chemicals are used in the production of electronic devices as well as printers ink. An excellent article by Brian Palmer discussing this subject in depth in Slate Magazine is well worth reading. Many discussions center around the "readability" factor. E-readers are said to be easier on your eyes than tablets like the iPad because they do not flicker. Some say curling up in bed with a computer of any kind is unnatural. Others prefer the physical connection with a nicely bound paper book as well as the ability to peruse a real library. I believe that as desirable as real books, magazines and newspapers are for many, the battle is over almost before it has begun. Young people have grown up with electronic information sources of all types; the Internet has been used by the public for fifteen years. I'm confident most types of printed material will go the way of written correspondence, newsletters, technical journals, phone books, dictionaries, encyclopedias and reference materials of all kinds. These have disappeared with barely a whimper. The days of young children carrying thirty pounds of text books to school are numbered. Type designers and page layout professionals go to great lengths to make sure their results are - above all - readable. Why can't the rest of us do the same with our business cards? How often do you see an email address like this? This may be an absurd example but it illustrates the point. Cards are distributed to exchange contact information. 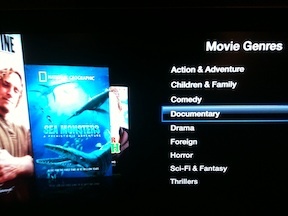 If the artwork, type styles and other design elements make that difficult they should be changed. Specifically email addresses ARE NOT CASE SENSITIVE - EVER. Once more - email addresses ARE NOT CASE SENSITIVE - EVER. Ask someone you trust to tell you whether your business cards are readable - without a magnifying glass and without several guesses as to whether that is a "1" or an "l". If that last phrase doesn't make the point, I don't know what would. You have to give Apple credit for one thing - they've really stirred up a hornet's nest in the tablet computer business. Think back just one year - does anyone remember a single mention of "tablet computer?" Probably not unless it was an historical reference to Alan Kaye's Dyanabook design (1968), the Apple Newton (1993) or Microsoft's tablet announcement (2000). With the exception of "convertibles" and other variations on the PC notebook theme, major computer companies did not appear to have a tablet device under consideration - much less development. Fast forward to the present. 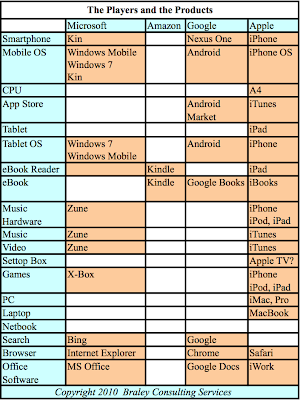 Technologizer just published a list of 32 tablets from 26 companies. A few are available; most are "coming soon". Vendors include the big names - HP, Motorola, Dell, RIM, Samsung, Sony, Cisco, Lenovo and Toshiba - but others are really a stretch - Nefonia and Fushion Garage for example. Very few are direct competitors to the iPad; some are aimed at students with very low cost and others are directed specifically toward businesses. Some are as small as 5 inch screens; the iPad is 9.7. CIO has a discussion of 15 Apple iPad Rivals as well. It's phenomenal that a category of product that did not exist a year ago is all everybody is talking about - not just a gadget but a whole category of gadgets. Certainly the personal computer was a new product category but it took ten years to catch on (1975-1985). This situation reminds me of the time way back in 1995 when I wrote an article on the "new thing" called The Internet ("The" was capitalized in those days). Now the Internet wasn't really new then; it had been in wide spread use in the Defense Department, universities and research institutions for years. In those days mere mortals could search specific locations on line using Compuserve, AOL and Prodigy. You couldn't Google or search Web sites since Google and the Web had not been invented. I did search the archives of the Minneapolis Star Tribune using Compuserve and saw that three years earlier there was only one mention of the Internet; a year later it was less than a hundred; from then on it exploded into the thousands. That's the trend I see happening now - not just due to the iPad - but the Mobile Internet in general which includes smartphones and other devices yet to be named. I predict that in three years most people will find it hard to imagine a world without tablet computers. Many of the new technologies and “gadgets” we encounter today are related to the “Mobile Internet”. You’ve probably heard the term and have some vague notion what it’s all about. It can be embarrassing though, to ask questions in this area when everyone in the room seems to understand what’s happening – except you! Believe me, you’re not alone; most people have little comprehension of the dramatic changes that are occurring today – changes that will completely alter the way we work, play, learn and communicate in the very near future. The Internet is a collection of millions of computers connected by a complex collection of cables. A set of programs - often called protocols - make these computers work together. The World Wide Web (the Web) is collection of files that are stored on Internet computers (called servers). These files can be viewed on your computer using a browser program and they are sent to your computer by a program called a Web server. There are numerous programs besides the Web that use the Internet – an email application such as outlook would be one; file download using FTP is another non-Web application that uses the Internet. Incidentally, your computer can have a Web server installed allowing people all over the world to access files you want to share – you can host your own Web site and it is really not that difficult to do. A Feature Phone is a cell phone that can store your contacts, send and receive email, browse the Web, play music, etc. It comes with a built-in set of programs (called apps – short for applications). A Smart Phone is a step up from a feature phone since you can easily install apps yourself. The Apple iPhone 3G released in 2008 was the first true smart phone but many others have been introduced since that time. The MobileBurn Web site contains a searchable database of recent phones. Apps on these phones use the Internet and may or may not use the Web. The important point is they are very simple to use and do not involve a browser – they connect directly to various Internet/Web services with the simple touch of a button. A Netbook is a small, low powered, low cost laptop computer. They are light duty computers intended for mobile tasks including email and Web surfing. Their low powered processors can not handle video production and their small screens and keyboards also limit their uses. An eBook Reader - or just e-reader - such as the Amazon Kindle is primarily used for reading books downloaded from the Internet. Their specialized “eInk” displays are said to be easier on the eyes than a traditional display for extensive reading. They are very lightweight and some can also surf the Web. A modern Tablet Computer is a “real” computer since it has a general-purpose operating system and the basic hardware elements of a PC. The Apple iPad is the best know example at the present. Virtually every major electronics company would like to produce an “iPad killer” and there are announcements every week by somebody who will make one “soon”. Recently discussed and announced models have included smaller screens than the iPad, have been directed toward business more than consumers and are promoted for content creation and not primarily consumption. Most tablets discussed so far use smart phone operating systems but others will use a mobile version of Windows 7 to mimic a standard PC. · Confusion will be rampant in the near term since it will be difficult to distinguish one category from another. Is a device with a five-inch screen a large smart phone or a small tablet? 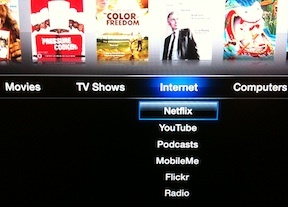 As new devices come out, new categories will emerge as well. · The typical wireless data plan has allowed users unlimited data downloads for a fixed fee of $30. That will change soon since smart phone and tablet usage is overwhelming the infrastructure of the carriers. Some are already moving toward “tiered” pricing where you pay for different levels of capacity. · Many of the specialized “gadgets” we have today will be “rolled into” smart phones and tablets. You will no longer need basic cameras, GPS navigation devices, MP3 and DVD players, calculators and a host of other devices since these can easily be incorporated into smart phones and tablets. · Since tablets are general-purpose devices, they pose a serious threat to both netbooks and ebook readers. · Just as a few companies have dominated the PC industry, it is likely that many smart phone and tablet makers will be knocked out of contention in the next few years; Investors and consumers are already placing their bets. · Speech recognition will be widely used to dictate text, search the Web and perform other basic data entry tasks. Versions available today are very accurate, easy to use and inexpensive. Users will find that the best keyboard may often be no keyboard. The new world of the Mobile Internet is here and the fast pace of change occurring now means our information society will be completely remade in ways we can barely imagine today. Many of us take more photos on a long weekend than we did the entire time we used film cameras. Arguably the quality is improved based on immediate feedback and numerous retakes. We also avoid finding out when our film is developed - and our vacation is over - that an entire roll was poorly exposed due to unusual lighting conditions or an improper camera setting. All in all we feel like we've solved one of the world's greatest problems - documenting our lives for future generations. After all we repeatedly view, sort and arrange those precious pictures taken a century ago. We hang them on the wall and proudly point to great-uncle Eggbert as we relate our family's illustrious or not-so illustrious history. But there is a looming downside to the digital age and it affects much more than our photo libraries. I'm often ask about the best way to store/archive photos and other files for the long term and I give the same simplistic answers as every other "expert" - make copies on CDs, store them off-site, etc., etc. But the very serious problem of long term storage of files of all types was discussed recently in Computerworld and here is a hint of the problem. The Domesday book - a detailed property ownership survey in England commissioned by William the Conqueror - was published in 1086. It was recorded on sheepskin and written in Latin. In 1986 an updated version was prepared using the latest technology - laser discs. Guess which one was readable fifteen years later - assuming you or a friend could read Latin. That's right, the 935 year old book could be read but the "modern version" could not because the laser disc players and software were obsolete. Reading the 1986 version required significant custom hardware and software engineering. Reading at least part of the the article by Lamont Wood is informative. Organizations with substantial concerns include the Library of Congress, the National Archives and the U.S. Geological Survey and you can forget about gigabytes; they talk in terabytes and petabytes (one thousand and one million gigabytes respectively.) The problem is reminiscent of the Year 2000 Problem but this one will not be over in five years. Digital data has the potential to last literally forever - it's all just collections of zeros and ones - providing archiving strategies are developed to store those quadrillions (petabytes) of bits. If you're thinking about taking the plunge and purchasing one of the many e-readers (sometimes called e-book readers), you should know that competition is heating up. New models - some with color screens and other extra features - will be introduced over the next few months. For a discussion of what's happening read this excellent Computerworld article. It may be true that the 2010 holiday season belongs to the iPad for tablets and that laptop-minded customers are not ready yet for tablet PCs. But 2011 will be the year when the tablet wars begin in earnest, says [Tim Bajarin from Creative Strategies] and Microsoft can't afford to be late. While the article focuses on Microsoft, there is also good information about a number of other important tablet developments by major companies. I've been thinking about this topic for some time and decided now that the back-to-school and Christmas shopping seasons are upon it's to time do it - and nothing represents the Christmas spirit like a shiny new Motorola DROID 2 running the Android 2.2 "Froyo" OS and including Flash Player 10.1, a 3.7 inch screen, a slide-out QWERTY keyboard, a five (count 'em five) megapixel camera, an 8GB microSD card and a 3G mobile hotspot feature (for an amazingly low $20 per month.) Am I right? Apple - Simplicity is the key - If you want to walk into a store, pick up a phone, set it up and begin using it in an hour, buy an iPhone. • Tightly controlled apps - security, viruses, etc. Android - Vast array of choices and decisions - If you want a carrier other than AT&T, or a physical keyboard, a larger screen or other specific hardware features and want no restrictions on your apps, then buy an Android phone. • Wide array of features that vary from model to model - larger screen sizes, more physical buttons, physical QWERTY keyboards, higher resolution cameras, customizable screen layouts, dedicated social network functions, etc. • Multiple OS variations - There are currently five different Android operating systems in use (1.5-2.2) and each vendor can add their own user interface (UI) to the OS. There are of course many other smartphones available but Apple and the Android family are all the rage today. Apple defined the category with the iPhone 3G in 2008. Google changed the game by introducing an operating system that runs on many phones and dozens of companies seized on this approach. This is reminiscent of the PC wars in recent years - Apple versus the "PC". While it is often stated that Apple lost that battle, remember that IBM - the other major player - failed in the business altogether due to brutal price competition. Contrary to poplar wisdom, IBM tried to stop others from making PCs but less than ten months after the IBM PC was introduced in 1981, the first clones were announced. The current hoard of Android phone manufacturers might look like an army storming the Apple "castle". What should not be overlooked in this scenario is that the attacking warriors are also trying to destroy each other - not a pretty scene. Who will ultimately prevail as the preeminent Android provider (like the 1990s Dell or HP) is anybody's guess. The variety of choices in Android hardware and operating systems is confusing for many people. These differences can cause serious problems for vendors as well as explained in this article by JR Raphael in CompterWorld. Raphael is normally a vociferous Android proponent. A footnote about Apple: Rumors have circulated for years about another carrier for the iPhone. In the past these have sounded more like hopeful speculation for the "I hate AT&T crowd" and those with poor AT&T service but recently the rumors have coalesced into a strong possibility that Verizon will be a choice after the first of the year. Stay tuned. Early this year everybody was going to sell an ebook reader to compete with the Kindle. However, the introduction of the $500 iPad - also an ebook reader - changed everything. The IEEE Spectrum has a really good discussion of the latest developments in this fast changing field - who's in who's out and who's on the ropes. As the price wars continue, remember an ebook reader is only as good as its supply of books. As companies drop out of the race their devices could become $200 boat anchors. Whoops, sorry about the old cliche - boat anchors need to weigh more than a pound! A reader ask for more information on this item from a previous post. An address you see in an email message or web page may look legitimate but the link connected to that address may be entirely different. The button or words you click on are totally arbitrary and the underlying web address (the hyperlink) is what matters. There are two easy ways to discover the real address of a clickable button or text phrase. You can "hover" over the item - move your mouse pointer over it without clicking - and see the real link displayed - usually at the lower left border of the browser window. You can also right click on the text or button and choose "copy the link" or "copy the shortcut". Then past this into your browser window address bar or any other document and see the actual link displayed. Both approaches - hover and copy/paste should also work with email messages that include links. As mentioned in the earlier post, you should look closely at the Top Level Domain Name - which includes .com, .edu, .gov and country codes such as .us, .ch, .ru, etc. The country code for Cameroon is .cm and a common mistake is to type .cm instead of .com. If you accidentally type MyBigBank.cm instead of MyBigBank.com, you will go to an entirely different site and could be tricked into providing the password for your account on a web page that is a perfect copy of the legitimate bank site you normally see. "Phishing" is an attempt to trick you into providing personal information such as bank account or Social Security numbers to someone who will use it dishonestly. Modern techniques are very sophisticated versions of the "Nigerian official who wants to share $40 million with you" scams. These are seductive since they appear to be messages from a source you know and they are addressed to you by name - not "dear friend". Often they are requests for you to update contact information and will appear to come from the address of a bank or store you deal with and will have the logo of the institution prominently displayed. If you know only one thing about Internet addresses, you can avoid many of these plots. A PC Defender - What do you think of his idea? John Dvorak, a well known PC writer. has this to say when comparing desktop PCs to mobile devices "With my PC I can actually calculate, with accuracy, the trajectory of a rocket shot to the moon, and the amount of fuel it needs to get there. On my desktop." Is this something we all need to worry about? Read the entire article in PC Magazine. iPad Wannabees - Bargin or Scam? Online sites like eBay are offering iPad like tablets for less than $100. The devices are being sold under names like Apad and ePad, mostly from vendors in China. But buyer beware so read this article before you take the plunge. For many years Microsoft, Intel and Dell lead the league in the minds of investors. The following snapshot of stock prices over the last five years shows an entirely different story today. The chart shows how stock prices of six leading technology companies have changed over five year and one year intervals. In the extreme cases Dell lost 66% for its investors and Apple gained 498%. The other two "big names" a decade ago - Microsoft and Intel fared only slightly better than Dell. Is Facebook getting too big to be useful? According to one writer Facebook's social network can't mirror the actual social networks, or social groups, that people have. Because of that, users are beginning to notice a curious effect: The more you use Facebook, the less usable it becomes. 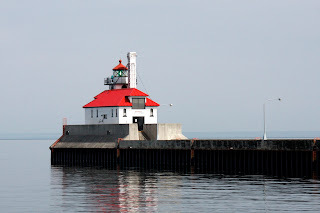 See what you think of Mike Elgan's article. More generally, this excellent NY Times Magazine article "The Web Means the End of Forgetting" by Jeffrey Rosen is a fascinating look at the endless archive of everything we say to everyone. Here's a quote that should get your attention. "It’s often said that we live in a permissive era, one with infinite second chances. But the truth is that for a great many people, the permanent memory bank of the Web increasingly means there are no second chances — no opportunities to escape a scarlet letter in your digital past. Now the worst thing you’ve done is often the first thing everyone knows about you". Is DC culture changing with the times? According to a recent article in the Washington Post "To do business with the feds, BlackBerrys are not preferred; they are often required. To my knowledge, I don't have contracts that require I get an iPhone for an employee," said Frank Smith, chief information officer for McLean consulting giant Booz Allen Hamilton. "I do have contracts that stipulate BlackBerrys." ... But people [including] app developers, telecommunications companies and even the chief technology officer of the United States -- think change is coming..." Read the complete story. Photo books have existed for several years but there's always room for something new. The complexity of photography and publication design means there are still opportunities for improving the design process as well as the user interface. Picaboo is a recent entry into the field and is worth considering. PC and Mac versions are available for download free. In my early but incomplete experiments it appears powerful and easy to use. My recent post identified app categories but did not name names. There are so many in each category I didn't want to play favorites. But, that is exactly what makes app selection so difficult - there are so many to choose from. So here are the names of the ones I use most frequently - you can search for them at the app store. Remember iPhone apps are usable on the iPod Touch and iPad. I am also interested in starting a discussion of apps on other devices and would be grateful for comments from Android, Blackberry, Nokia, Microsoft and other smartphone and tablet users to kick it off. Comments are always welcome (go to the end of this post to leave a message). The BestAppSite is always a good source for app reviews. Is the Apple iPad just an overgrown iPod? Since Apple announced the iPad in January it has sometimes been dismissed as just an extra large iPod Touch. After all they bear a striking resemblance – except for size – when you put them side-by-side. In part this is due to the minimalist design embodied in Apple products – there are few physical buttons on either and those that exist are small and hidden from view. The devices also use a similar interface – a single glass surface displaying twenty to thirty icons with no physical keyboard (an optional wireless keyboard is available for the iPad). Most operations are initiated by touching or sliding one or more fingers on the surface. Neither has a built in phone and both can run most of more than two hundred thousand apps available in the Apple App store. But it turns out, size does matter. The iPod is certainly more convenient to take everywhere - measuring only 2.5 by 4.5 inches. The iPad is about the size of a thin book measuring 7.5 by 9.5 inches and weighing one and a half pounds. To see the important advantages the iPad has, you need to divide apps into three categories: those that run fine on both devices, those that work but not very well on the iPod and those that require the large iPad screen to function at all. Navigation apps would be in the first category. Although a large display would certainly show a better map, the convenience of a small device while traveling will cause GPS devices and smarpthones to be the primary platform. Other well-established apps including contact management, calendaring and email will do quite well on the small screen. However, the power user with lots of contacts and lots of appointments will definitely appreciate the iPad calendar and contact applications. Web surfing works on small devices but when you cross the line from simple searches to full blown web site display, the advantage of the large screen is obvious. Debates now concern whose display technology is best; debates which have been on going since the birth of the CRT display some forty years ago. Possibly the most important use of tablet computers has barely begun. Successful tablets in the past have been used in commercial applications – health care being a primary example. When current tablet technology – including a touch screen interface and easy app installation – is adapted by the corporate world, tablet use will explode and the large screen iPad may be the device that propels this development. Windows based tablets will reignite the Microsoft-Apple wars of the past. This debate will become more complicated when you ask “which Windows mobile OS are you talking about? The company currently has four incompatible versions. The ability to develop and display a presentation using an iPad illustrates the potential. The same 24-ounce device used for routine communication, web surfing, as well as corporate and private document retrieval can be used for boardroom presentations. Holding an iPad and changing slides with a finger like turning a page in a book completely alters the feel of the task. It is a change that presenters – other than die hard mouse fans – will quickly appreciate. Make no mistake – the iPad is not perfect. One of its greatest strengths is currently its biggest weakness. The simple touch screen interface exists because the user does not interact directly with the operating system. You never navigate through folders to find documents; each app keeps track of its own files. Tap on an app such as Keynote – the Apple presentation program – and you immediately see a list of all Keynote presentations. Tap a file and it opens; nothing could be simpler. But, what if you have fifty or more presentations and they are all stored in one folder? This will be a problem. The newest version of the iPhone operating system – referred to as iOS4 – introduces folders for applications. This allows you to have more than the current 180 apps on an iPhone and 226 on the iPad. It would make sense that this change will eventually lead to a folder structure in the applications themselves so organizing files within an app will be much easier. Whether or how Apple will address the fact that files of different types cannot be stored together – e.g. all files of any type associated with a project in one folder – is unclear. Since PC and Mac users alike waste enormous amounts of time trying to “find stuff”, coming up with an elegant but powerful tablet based filing system will be critical. While tablets of been around a long time, only since the iPad was released do you see them popping up everywhere. Owners show them off and answer a barrage of questions about what they do. They are rapidly changing from specialty PCs to mainstream products. A variety of devices will coexist for many years but as the power of tablets increases and apps continue to multiply, it is likely the iPad and others like it will take a bigger part of the information pie. I was going to list my five favorite iPad iPhone Apps but quickly realized such a limited list would be impossible to create. So here is a slightly longer list in no particular order. These are app categories and not specific apps since there are often several good ones to choose from in each category. Keynote is the only app not available on the iPhone. Most iPhone apps run on the iPad and there are now over 10,000 iPad specific apps. Of course most of these apps are available on numerous other smartphones. I'm just writing about what I know best. Traffic and Navigation - I've avoided many travel delays by checking traffic conditions before and during my trips. Of course locating a destination as well as a restaurant or other meeting place is a snap with the many navigation/GPS apps. All the major navigation device makers have iPhone apps. Voice Search and Dictation - Voice search is much easier than typing on any tiny keyboard and extremely accurate. 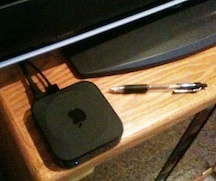 It's so good I'll even pick up my iPhone or iPad to do a quick search when using my desktop Mac or laptop PC. If the iPad is nearby, I just reach over and tap the voice search app, speak the query and see the Google search results appear. Using one finger, I scroll the list and tap on specific entries. News and Weather - I check several news sites each day as well as a number of technology related sites. These are "readable" on the iPhone and beautiful on the iPad. Calendar, Contacts and White Pages - The calendar and contact apps are integrated across all devices. 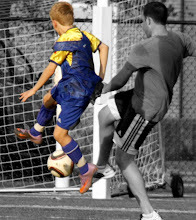 Photo Editing - I have a DSLR and often use Photoshop LE. Lately I've done much of my work on the iPhone and iPad. The latter does not have a camera - not a big omission in my opinion - but editing photos is simple using one finger to manipulate the controls. 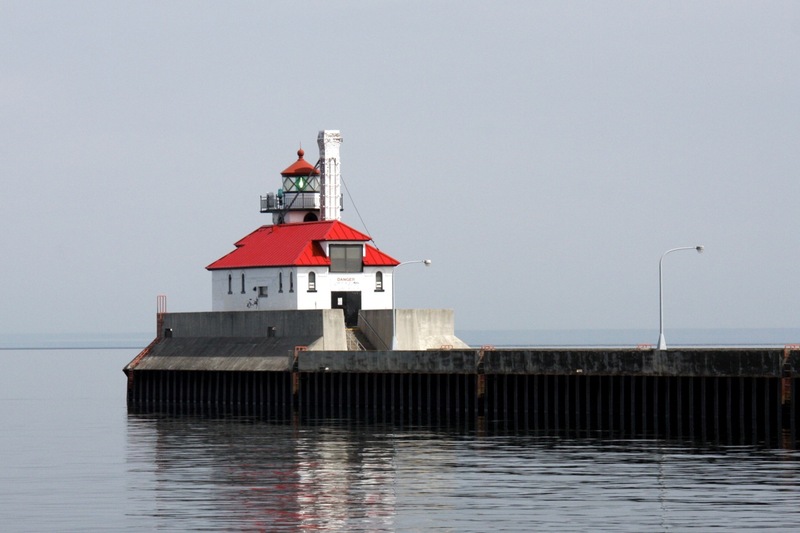 The original photo of a lighthouse in the Duluth harbor is shown first along with three "artistic" variations. Remember I'm a programmer - not an artist! Presentation - Keynote is the Apple version of Powerpoint. It's easy to learn and a joy to use the iPad in presentations. Try scrolling through slides by swiping your finger on the screen and you'll never go back to a keyboard and mouse. Flight Tracking - Checking flight information is a snap with one of these apps. Most reports indicate that Apple and Google Android phones are gaining ground at the expense of other smartphone companies. RIMM (Blackberry) does not have the level of consumer interest or app store capability that are driving the current market. Palm, the early leader, was recently acquired by HP but it appears their primary interest is in the Palm WebOS operating system for tablets and not Palm phone hardware. In fact at the time the acquisition was announced, HP dropped their plan for a Windows tablet in favor of the "Streak" based on WebOs. The choice is between a tightly controlled product from Apple where hardware, operating system and applications are well integrated and the wide open approach of Google where numerous companies make the phones which can operate over several carriers. There are currently five different versions of Android; each of which can be modified by the manufacturer. It's not easy to answer the question "exactly what is an Android phone?" Having AT&T as the only carrier has definitely hurt Apple but it is likely that will change and Verizon or T-Mobile will be an option before the end of the year. Since the Apple iPad exploded onto the scene in January it might seem that tablets are a brand new idea. However, some tablets have been used in recent years where a portable handheld device operated with a pen or stylus could do the job. This would include medical applications where they could replace a chart or possibly warehouse and delivery functions. The tablet concept, however, is really quite old. In fact the "Dynabook" was created by Alan Kay in 1968. Kay wanted to make “A Personal Computer For Children Of All Ages". Read more of the details here. Alan Kay and collaborators at Xerox PARC are credited with designing many of the elements of modern computing including the mouse and the graphical user interface nearly forty years ago. And, as with most breakthroughs, there were a lot of trys and a lot of failures preceding any successes. Read A Brief History of Unsuccessful Tablet Computers. Will the iPad Change the Way Congress Does Business? The rapidly evolving fields of mobile hardware, operating systems and apps is shaking up the list of prominent consumer technology suppliers. In the past, we heard a lot about the PC makers - Dell, HP, etc. - as well as cell phone companies including Motorola, RIM and Palm. These companies are becoming "niche players" - supplying PCs and cell phones - while Google and Apple are battling it out for the hearts and minds of the public. In the following chart I've listed four companies and indicated the products they offer. Microsoft, Google and Apple have a broad range of offerings and will be competing across the field. I've included Amazon because of its huge content offering as well as its leadership position in the eBook field. 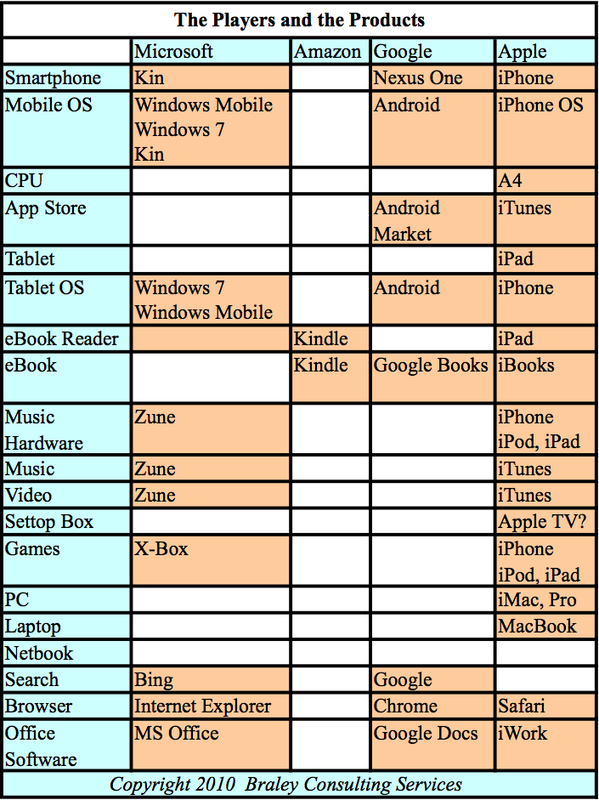 While I was preparing this chart several significant announcements were made - Microsoft decided not to release it's Courier tablet. HP did the same with its Slate tablet. At the same time HP announced it would purchase beleaguered Palm - once considered the leading smartphone company. This could mean HP will switch to the Palm WebOS for its tablets instead of Windows - a major change for two big players. It is likely that many products will be merged into other categories - mp3 players and GPS systems will be included in smart phones, for example. Nevertheless, it is instructive to compare the offerings each player currently has and try to predict the ultimate winners of this fascinating contest. This year has been dubbed "The Year of the Tablet" for good reason. In addition the much-hyped April 3rd release of the Apple iPad, the company responsible for the design of many of these devices believes fifty other products will be introduced in 2010. While most people aren't familiar with ARM, this company licenses the right to its processor design to the majority of smart phone and tablet computer makers. Many of these devices will use mobile operating systems similar to those used by smartphones today. A few tablets will be be based on the Windows OS and some will use the Intel Atom processor which is at the heart of most netbooks. While tablets have been around for twenty years and Microsoft introduced their mobile OS in 2001, these early models have been primarily used in specialized fields such as healthcare where they could replace a chart, clipboard or PC at the bedside. It's possible to get confused at this point since "tablet" also refers to totally unrelated drawing devices used with a "pen" by graphic designers - a "graphic tablet". While some people couldn't imagine using anything less than a full operating system like Windows or MacOS, differences in mobile and desktop computing are forcing a second look at OS technology. Desktop (and laptop) computers are based on keyboard input and mouse control. For most people they also involve a small number of very complicated programs; the latest version of MS Word has 1,500 commands and Excel has a similar number. In contrast smartphones and their new cousins, tablets, use touch screens for the user interface (UI) and a large number of simple programs (apps). In addition smartphones and many tablets will incorporate GPS, music, video and game applications that are very different from the desktop PC model. If you’ve always wanted a camera with the features and image quality of an SLR and the size of a compact, your dream has just come true. There is a new class of cameras referred to unglamorously as Micro Four Thirds. Four thirds refers to a sensor size found in some SLRs while Micro indicates the camera bodies are small. These cameras look much like compacts but have interchangeable lenses – which of course will add to the size depending on the focal length. They are smaller than SLRs because they do not have the “reflex” mirror or prism used in the SLR viewfinder. Image composition is done with the LCD or optional electronic viewfinder. The Four Thirds sensor size is on the small end for an SLR but many times bigger than any sensor found in compact cameras. Pixels can be bigger on a larger sensor and pixel size is more important than huge pixel counts. If you are wondering about the "four thirds" name, digital camera sensor sizes are based on an archaic TV tube measurement system that only vaguely makes any sense at all. 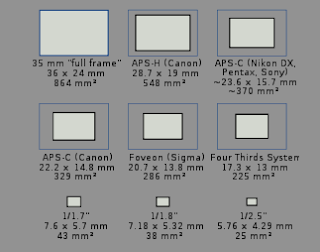 This diagram illustrates various sensor sizes beginning with "full frame" (upper left) that is equivalent to a 35mm film negative. Only a few high-end DSLRs have such a large sensor. The four thirds sensor is shown at the right of the second row. It is significantly smaller than some other DSLR sensors in the first two rows but many times larger than any compact sensor shown in the third row. Panasonic and Olympus have products available today with prices in the $600-900 range. As with SLRs, additional lenses can drastically increase the price of the camera “system”. For more information on compact and DSLR cameras look at my comparison video. Lens flexibility is a major design improvement with the Micro Four Thirds format. The lens "mount" or connector usually differs from camera to camera which is why Nikon lenses do not fit on Canon cameras. The Micro Four Thirds format defines both the sensor size and the lens mount so lenses are compatible among the various brands. Because lenses can be the most expensive component of your system and because they often last years longer than the camera, this turns out to be a very big deal. At this writing the Panasonic Lumix DMC-GF1 and Olympus PEN E-P1 have nearly identical specifications: same sensor size (4/3), same pixel count (12mp) and same burst rate (3fps). The Panasonic offers built in flash while the Olympus does not. The Olympus has image stabilization (IS) but the Panasonic does not. 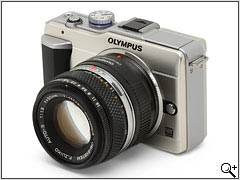 The Olympus IS is built into the camera resulting in simpler, smaller and less costly lenses. More companies will get into the fray soon which will make more cameras and lenses available and inevitably cause prices to drop. The winner may be the company that comes up with a more appealing name for the product category!